The eagle eye by Eschenbach! true-to-life and precise images that youll be able to enjoy bird watching and nature observation to the full. Let the adventure begin!  The magnesium housing means that the farlux® SELECTOR D is impact-resistant and, above all, lightweight.  The special naturebright coating delivers precisely what the name says: an exceptional true-to-life, colour accurate and bright image.  The BaK-4 prisms are phase corrected for the ultimate viewing experience and have a high reflective coating.  Equipped to cope with all types of weather: Water pressure proof (5 min at 1 m water depth) and filled with N2.  Threaded for tripod adapter. The farlux® SELECTOR D is of course also ideal for bird watching. Comes complete with straps and case. Sheer pleasure for the eyes! 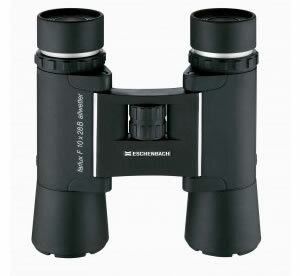 Imagine a pair of binoculars which is not only optically stunning but has all the versatility of Zoom optics and you are thinking of... the Eschenbach SELECTOR V.
With fantastic optical quality and brilliant realistic colour reproduction, farlux® SELECTOR V binoculars are particularly suitable for bird-watching and sports.  With SK15 and BaK-4 phase corrected, high reflection prisms. The high reflection coating on the prisms produces an image which is approx. 8% brighter.  As a result of the naturebright coating the light transmission in the spectral range is optimized by green light. This makes the image even more true-to-life and even more comfortable to the eye.  The farlux® SELECTOR V is waterproof and can therefore be used even in damp conditions.  Even at 15-times magnification the brightness of the image remains consistent and free from tunnel vision.  The users personal dioptre adjustment on the centre adjustment wheel can be securely locked to prevent movement.  The ergonomic grip on the front side of the binoculars means that the farlux® SELECTOR V can be held firmly and securely, even during prolonged use.  Also includes screw thread for tripod adapter. Comes complete with starps and case. Experience maximum image brightness and colour reproduction with the new naturebright coating on farlux® binoculars. We have again been able to increase light transmission up to 93 %. With naturebright, you can enjoy optimum colour reproduction with farlux® F silver binoculars too. This is made possible by the 64 layers of coating on the prisms.  No water marks on the lenses and  Simple cleaning of them due to the anti raindrop coating.  Robust even in wind and weather as filled with Nitrogen and water-proof.  Can be used with (sun)glasses due to retractable eye cups. Individual adjustment for spectacle wearers with 2 step extension and retraction of eyecups. 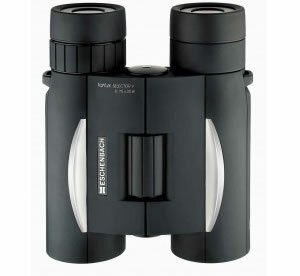  Safe transportation and storage of the binoculars is provided by the Deluxe case included. Comfort during use is guaranteed by the padded carry strap which is also provided.  Simple cleaning of them due to the anti raindrop coating.